Luke Dimech, Joe Chamberlain, Angel Agius, Daniel Hansen, William Ahlberg, Lorraine Sammut, Alexander Stevendahl and Ulle Skottling. 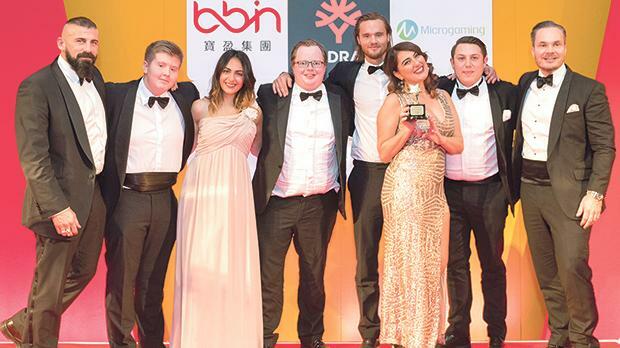 Videoslots was named Slots Operator at the 11th International Gaming Awards at a lavish ceremony at Grosvenor House, London, on the eve of ICE 2018, where it was recognised for its commitment to a social, interactive experience and vast number of slots available. The operator has now won the same award for three consecutive years and has plans to improve its content and introduce various new features to ensure it makes it four in a row. This was followed up at the Gaming Intelligence Awards where it was named One to Watch on the back of its customer-focus and new product innovation, with its Battle of Slots product continuing to lead the industry and the recent purchase of now-defunct PKR’s poker technology. Gaming Intelligence commented on how Videoslots has gone from a “minor industry player to a company that made significant gains in 2017” having found “faults in established industry wisdom and pursued an alternative path”. CEO at Videoslots.com, Alexander Stevendahl, who was on hand to collect both awards in London, said: “When we formed we knew the online casino industry could offer a far more engaging product to customers, and we’ve done all we can to introduce new features, the best slots and the most passionate people behind the scenes to do so. Having also been awarded four Meister Awards, the start of 2018 has been particularly successful for Videoslots, and with it launching a new poker product later this year, success looks set to continue.